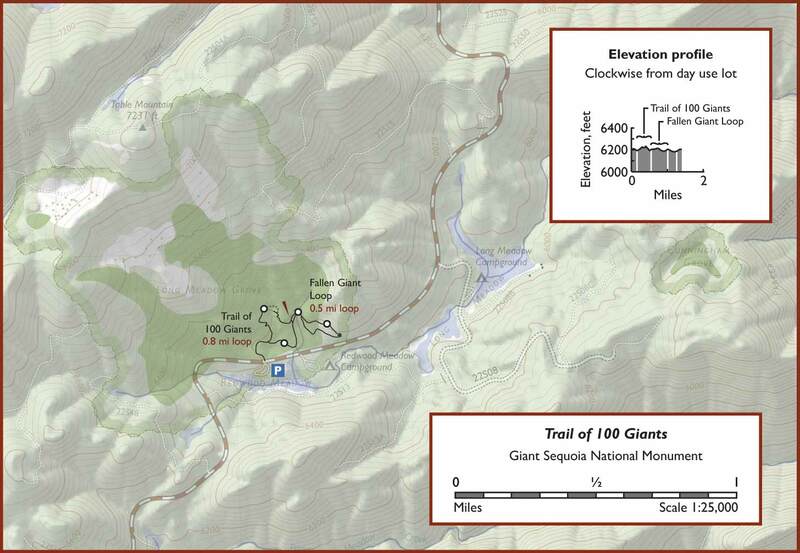 The Trail of 100 Giants, showing the double tree that fell across the trail in 2011. 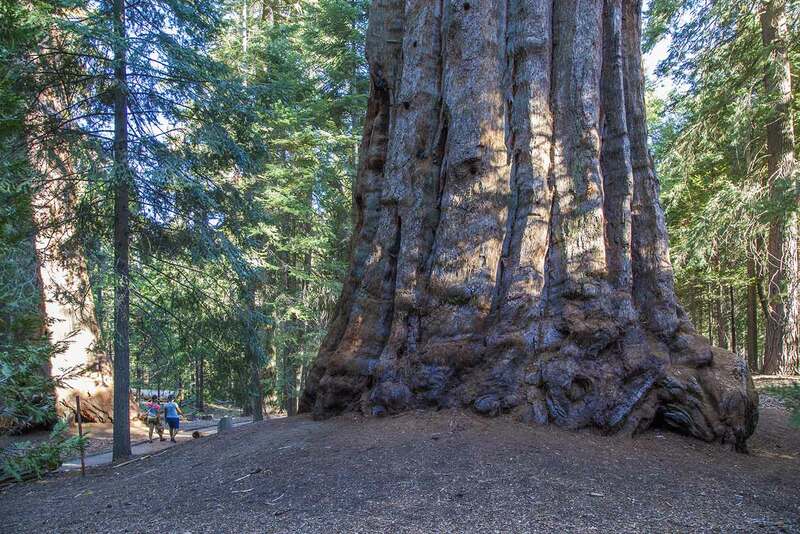 The Trail of 100 Giants is the most popular attraction in the Giant Sequoia National Monument, and it’s easy to see why. 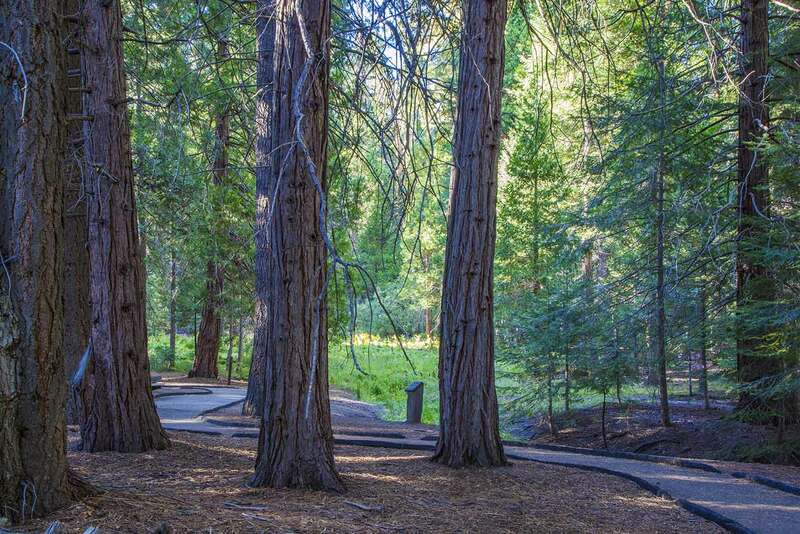 The trail is easy to get to, it’s short, flat, and paved, and it’s got a lot of really impressive trees. Nonetheless, this is still the National Forest, so it’s not exactly crowded - there might be 5 or 6 groups on the trail at any given moment, although many of those groups are families with screaming children. 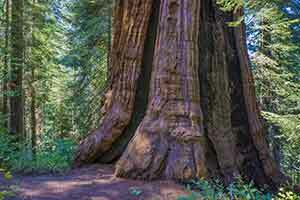 The trail’s name notwithstanding, there are in fact maybe 20 really big trees along the trail. Some of them are truly impressive. That’s actually pretty good for a trail of this length. 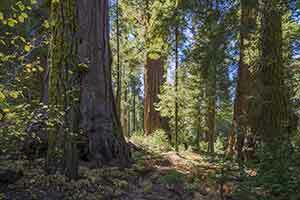 The sequoias grow in an exceptionally open pine forest. Much like the most heavily-visited parts of the Giant Forest, there’s almost no groundcover, probably because so many visitors go off-trail. 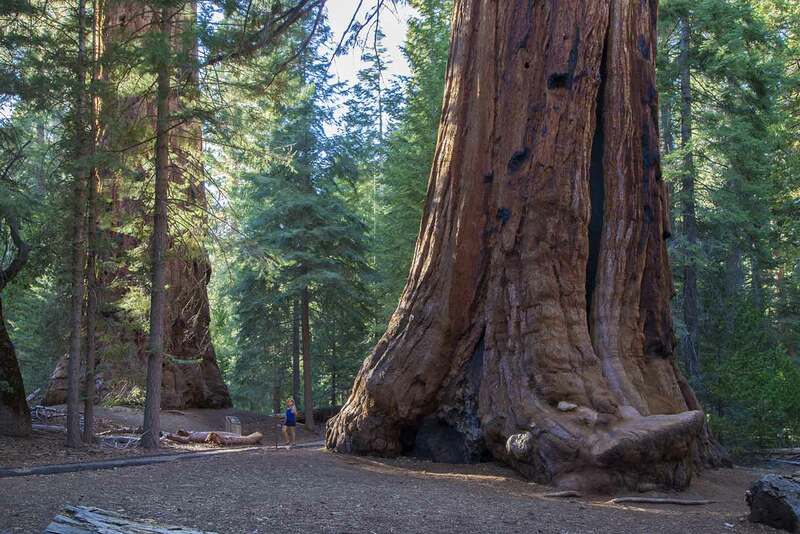 Although judging from the size of both the redwoods and the other trees, the entire grove appears to be old growth, there are a lot of small (and some big) stumps scattered throughout the grove, possibly dead trees that were cut down so they wouldn’t fall on visitors. Typically for a National Forest, the interpretive signs along the trail were written from a timber industry point of view. For example, a sign next to a magnificent old-growth Ponderosa Pine explains that this kind of tree is good for wood paneling. 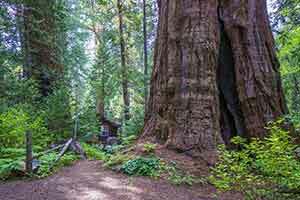 Across from the trail is the small but very attractive Redwood Meadow campground, located on a slight rise and surrounded by pine trees. Down the road a little is the less-attractive Long Meadow campground: located on a bumpy dirt road, it’s less developed and less scenic. Oddly, there’s a cattle chute in the middle of the Long Meadow campground. 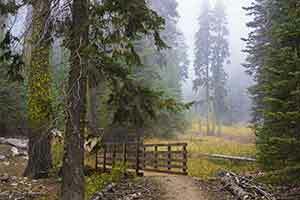 Otherwise, the trail is somewhat isolated; there aren’t any other trails or things to do in the immediate area. The Great Western Divide Highway is a long, empty road; wide, well-maintained, and relatively straight, with views of the conifer-carpeted mountains, it’s the most enjoyable road in the National Monument. 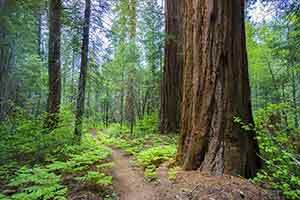 There’s an old logging road in the upper grove, but it’s heavily overgrown and the sequoias are small; it’s not really worth the hike. A short distance to the North is the Mule Peak fire lookout, but it’s now closed. Park in the southern (day use) parking lot. 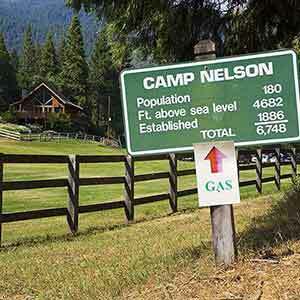 There are also a few day use spaces in the campground. In either case you have to pay $5. The trail consists of a central loop, a side loop off to one side, and a spur to the day use parking lot. 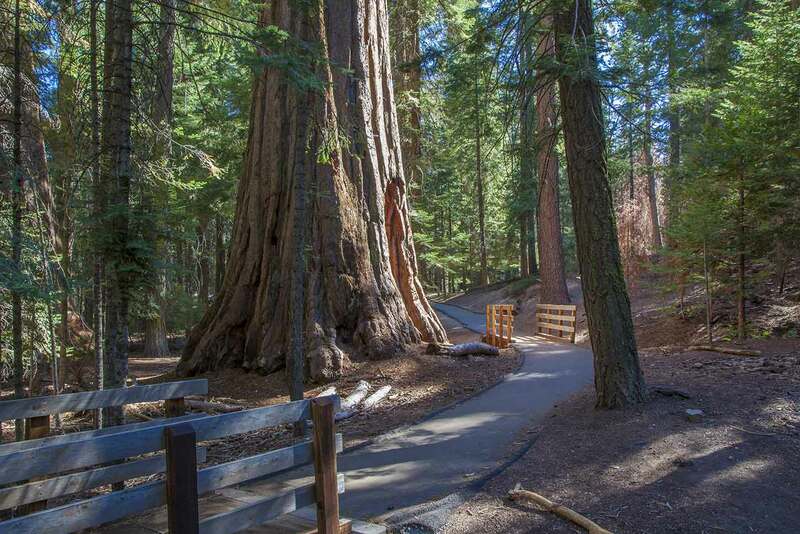 The central loop has the most sequoias, but the two side trails each have a really impressive tree. 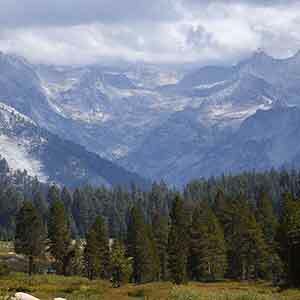 The trail winds around a gently-sloped hillside; most of the sequoias are higher up on the hillside. 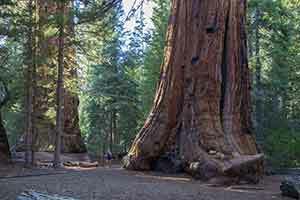 So if you hike the loop clockwise, most of the sequoias will appear in the first half of the hike. 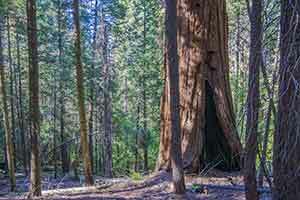 The spur trail gets off to a great start, with an immense sequoia right at the very beginning. 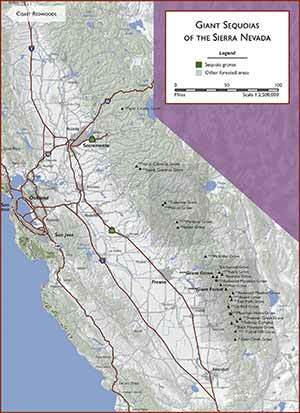 The rest of the short spur trail doesn’t have any sequoias. At a trail intersection where the right-hand trail is labeled "campground", stay left. This is the beginning of the main loop. Passing the popular "goosepen" tree and a little meadow, the trail switchbacks up a very gently-sloped hill (a lot of people just shortcut the switchbacks) to reach a large tree that fell across the trail in 2011. A boardwalk will soon be built to bypass this blockage, but for now you have to go around the tree on a poorly-defined, unofficial path. 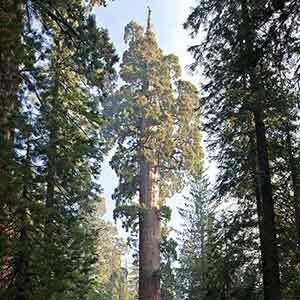 The trail then winds downhill, past a magnificent sequoia, to reach the intersection with the Fallen Giant trail. The Fallen Giant loop is home to another fallen tree; however, the tree that fell in 2011 is actually much more impressive. There’s one immense sequoia about a quarter of the way into the loop (going clockwise), but after that there aren’t any more sequoias on the loop. 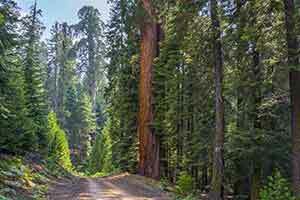 Returning to the main loop, the trail passes between a pair of big sequoias; the one on the left is especially impressive. 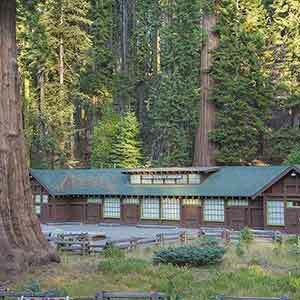 After this point there aren’t any more prominent sequoias on the trail. 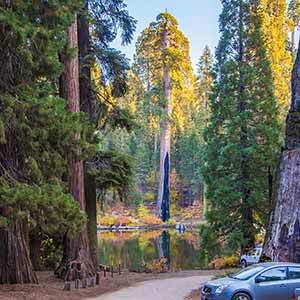 This Short video from Veronica Hill of California Travel Tips gives you a sense of how big the sequoias are.